In 1977, a series of functional growth hormone secretagogues (GHS), which activate the endogenous receptor of the stomach peptide ghrelin, were synthesized in order to stimulate growth hormone secretion from the pituitary gland. Following this work, subsequent efforts concentrated on the development of an orally active GHS with a long lasting effect and high bioavailability. This paper discusses the effect of the functional growth hormone GHS CP-477335 on the GH/IGF-I axis in tilapia, Oreochromis mossambicus, using both in vivo and in vitro experiments. Our results show that CP-477335 stimulates the release of growth hormone from the pituitary gland, as seen through application of the compound on whole pituitary cultures. in vivo experiments show that CP-477335 decrease plasma levels of insulin-like growth factor I (IGF-I), although further studies are necessary to classify this quantitatively. Growth in vertebrates is controlled by many factors, both genetic and environmental (Moriyama et al., 2000). In mammals, the hypothalamus produces two antagonistic hormones, growth hormone-releasing hormone (GHRH) and somatostatin (SS), which act to control growth hormone (GH) release from the pituitary through stimulation or inhibition of its secretion, respectively (Arvat et al., 2002). The situation is more complex in fish, as regulation of growth hormone occurs through the use of GHRH and SS as well as through other hormones, including dopamine, gonadotropin-releasing hormone (GnRH), thyrotropin-releasing hormone (TRH), and pituitary adenylate cyclase-activating polypeptide (PACAP) (Riley et al., 2002). Growth hormone is directly and indirectly responsible for many somatic functions including stimulation of somatic growth, aiding salt water adaptation, metabolism, reproduction and development (Arsenault et al., 2003; Riley et al., 2002). Growth hormone receptors are located on cell surfaces of many different target organs and may stimulate synthesis and release of insulin-like growth factor-I (IGF-I), a mitogenic hormone that carries out GH actions on the body. The biological actions of IGF-I are mediated through the IGF-I receptor and are involved in the regulation of lipid, carbohydrate, protein, mineral metabolism in the cells, differentiation and proliferation of the cells, and ultimately body growth. The liver is the main site of IGF-I production, though various tissues also produce it locally (Moriyama et al., 2000). IGFs in the extracellular environment are bound to members of a group of high-affinity binding proteins, the insulin-like growth factor-I binding proteins (IGFBPs). These IGF/IGFBP complexes in circulation can prolong the half-lives of IGFs and buffer the effects of high concentrations of IGFs. The proteins show inhibitory effects through competition with the IGF receptors for the ligand because the soluble IGFBPs have higher affinities for IGFs than the IGF-I receptors (Duan, 1997). IGF-I, working with or against its binding proteins, extends the actions of growth hormone and works to contribute to body growth. In 1977, a series of functional growth hormone secretagogues (GHS) were synthesized in response to cases of growth hormone deficiency syndrome. GHS activate a receptor to stimulate growth hormone secretion from the pituitary gland independently of GHRH (Bowers et al., 1977). Further GHS synthesis research aimed towards an orally active, long lasting effect with high bioavailability. Non-peptidyl molecules of that description were discovered and became drug candidates for various disorders involving the GH/IGF-I axis. Growth hormone secretagogues, namely MK-0677, have demonstrated significant and reproducible GH- releasing activity and are more potent than growth hormone releasing hormone (GHRH) (Petersenn, 2002). Through a reverse pharmacological approach, the synthetic GHSs led to the discovery of the GHS-receptor, which was cloned and found to be specific to the peptidyl and non-peptidyl synthetic GHSs (Arvat et al., 2002). At least two molecular isoforms have been found for GHS-receptor, which is produced by alternative splicing of a precursor mRNA. Only the long isoform, GHS-R 1a, is a functional receptor, primarily activating the phospholipase C/inositol phosphate/protein kinase C signaling route to promote GH release (Luque et al., 2004). The synthetic GHSs bind to the functional receptor and activate this signal cascade, which in turn induces the secretion of growth hormone. The GHS receptor was considered an orphan receptor until the endogenous ligand of the GHS-R1a was discovered with the use of the synthetic analogues, a 28 amino acid peptide, ghrelin, which has been shown to be a potent stimulus of GH release (Kojima et al., 1999). Ghrelin is mainly produced in the stomach, while smaller amounts are produced in the bowel, pancreas, kidney, placenta, thyroid, pituitary, and hypothalamus, pointing towards the many non-endocrine roles this hormone may play throughout the vertebrate body (Arvat et al., 2002). The first studies on ghrelin suggested it provided a vital medical link to eating and growth regulation, but it has since been determined that ghrelin plays an almost redundant role in appetite regulation and is involved more specifically in determining the metabolic energy substrate used for energy balance during conditions of nutrient excess, typically away from lipid utilization. Additionally, in mice and rats, it acts to stimulate food intake, decreases lipid metabolism, and therefore body weight gain, and increases gastric motility and acid secretion independently of its ability to induce growth hormone secretion (Wortley et al., 2004). This project investigates the endocrine mechanisms regulating energy homeostasis and growth in tilapia, Oreochromis mossambicus. We have investigated the role of the synthetic growth hormone secretagogues (GHS) in homeostasis. Specifically, we (1) characterized the action of the GHS, CP-477335, on growth hormone, prolactin, and IGF-I plasma levels in teleost fish, and (2) examined the effect of CP-477335 directly on the pituitary gland release of growth hormone and prolactin in teleost fish. New compounds are being produced to mimic and enhance the normal effects of their endogenous counterparts; among these, CP-477335 was synthesized by Pfizer Inc. in order to serve as a GHS. In preliminary studies, this compound has been shown to stimulate growth hormone secretion in rats, thus proving its potential to stimulate growth in mammals. This project further investigated the properties of this synthetic GHS with regards to its stimulatory effect of the GH/IGF-I axis in tilapia, a euryhaline teleost species. Tilapia, Oreochromis mossambicus, were obtained from a fresh water population reared at the Hawaii Institute of Marine Biology. Sexually mature fish weighing 80-180g were used and maintained in 22-26˚C fresh water and fed once a day with floating trout feed (2% body weight). All experiments were conducted in accordance with the Institutional Animal Care and Use Committee, University of Hawaii. Sexually mature male animals were maintained in identical settings in 20-gallon tanks with six fish per tank and one tank per treatment. Animals were each given a single intraperitoneal injection of one of the treatments. The five treatments tested were a control of saline, 1ng/g C-10 ghrelin (positive control), 10ng/g C-10 ghrelin, 1ng/g CP-477335 (low dose), and 10ng/g CP-477335 (high dose). Blood was collected from the caudal vasculature with heparinized syringes at 5 hours post-injection. Plasma was then separated from the blood by centrifugation at 12,000 rpm for 10 minutes and stored at -20 &ordm;C until analyses for GH, PRL, and IGF-I by radioimmunoassay. Males and female tilapia pituitary glands were removed, placed in a 96-well plate, and pre-incubated in biologically equivalent media (200 µl of isotonic bicarbonate-Ringer's solution (330 mOsmolal) containing minimal essential medium (MEM)) supplemented with penicillin (10 IU/ml) and streptomycin (100 IU/100 ml) at 28 &ordm;C with continuous agitation for 12 hours. The pituitaries were then washed with fresh media without supplemental antibiotics. Fresh media were then added containing either saline, the positive control of C8 ghrelin (10ng/ml), or increasing concentrations of CP-477335 (0.01, 0.1, 1, 10, and 100 ng/ml). After 8 hours, media were collected, and 200 µl Triton-X was added to each well before each pituitary was sonicated and collected as content samples. For both media and content, growth hormone and prolactin were measured by homologous radioimmunoassay. Release of hormones was expressed as the means of the percent release (100 x media/media + content). Figure 1. In vivo effect of CP-477335 on GH, PRL, and IGF-I release compared to control of saline and positive control of C10 ghrelin (10ng/ml). * P < 0.05, ** P < 0.01, *** P < 0.001 (n=7). Male and female tilapia pituitary glands were removed, and glands were diced with a sterile razor on a wax plate. The tissue fragments were incubated in trypsin solution (0.00625g trypsin/ 2.5ml PBS; 0.02% EDTA) at 28 &ordm;C on a gyrating platform at 40 rmp and agitated with a pipette every 10 minutes for 1 hour. Fetal bovine serum (0.5ml) was then added, and cells were centrifuged at 1200 rpm for 5 minutes at room temperature. The supernatant was decanted and fresh media were added (5ml) in order to reach a concentration of approximately 5.0 x 104 cells per well. These cells were then placed in a 96-well Primaria plate and pre-incubated in biologically equivalent media (200 µl of isotonic bicarbonate-Ringer's solution (330 mOsmolal) containing minimal essential medium (MEM)) and supplemented with nystatin (250 IU/ml), penicillin (100 IU/ml) and streptomycin (0.1mg/ml) for 4 days at 28 &ordm;C. Supplemented media were replaced once at 48 hours. After the pre-incubation period, media were replaced with un-supplemented media (serum-free, antibiotic-free) for two hours. Media were removed and treatments of biologically equivalent media were added containing either the control of saline, the positive control of C8 ghrelin (10ng/ml), or one of the increasing concentrations of CP-477335 (10-6, 10-5, 10-4, 10-3, 0.1, 1 ng/ml). After an 8 hour incubation period, media were collected, and 200 µl Triton-X was added to each well before each pituitary was sonicated and collected as content samples. For both media and content samples, growth hormone and prolactin were measured using a homologous radioimmunossay. Release of hormones was expressed as the means of the percent release [100 x media/(media + content)]. Radioimmunoassay is a procedure that measures minute amounts of a substance through a competition reaction with a radio-labelled substance. This procedure was carried out as described by Ayson et al. (1993) and modified by Yada et al. (1994). 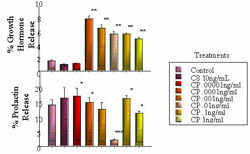 Group comparisons of plasma, media, and content sample hormone levels and were performed using a one way ANOVA followed by the least significant difference test. Calculations were performed using the computer program Statistica (StatSoft, Tulsa, OK). Figure 2. In vitro (whole pituitary) effect of CP-477335 on GH and PRL release compared to control of saline and positive control of C8 ghrelin (10ng/ml). * P < 0.05, ** P < 0.01, *** P < 0.001 (n=6). Figure 3. In vitro (dispersed pituitary cell) effect of CP-477335 on GH and PRL release compared to control of saline and positive control of C8 ghrelin (10ng/ml). * P < 0.05, ** P < 0.01, *** P < 0.001 (n=6). This study examined the effects of a novel growth hormone secretagogue, CP-477335, in tilapia in vivo and in vitro (whole pituitary and dispersed pituitary cell cultures) in an attempt to manipulate the actions of the GH/IGF-I axis. The in vivo studies may not have shown a consistent effect on plasma levels of growth hormone and insulin-like growth factor-I, but there are trends that can be seen from this data. Growth hormone release showed contradicting results between the first and second experiments; in the first, in which no significance was seen, there is a slight trend of inhibition that may possibly be seen if a future study utilizes a larger sample size. Plasma levels of IGF-I similarly show an inhibition in the first experiment and no statistical significance in the second experiment, once again with a trend towards inhibition. While the effect on growth hormone and IGF-I at the whole-organism level remains inconclusive, there does seem to be a biological effect due to treatment with CP-477335 which may become clearer with replication of the study with an increase in subject count. In both experiments, prolactin release showed inhibition in the higher dose of both the positive control, C10 ghrelin (10 ng/ml) and of the CP-477335 treatment (10 ng/ml). A possible interpretation of this information could be that a negative feedback control inhibited plasma levels of growth hormone and/or IGF-I, but further studies are necessary in order to make any conclusions. In a study on goldfish done by P. Unniappan (2004), intraperitoneal injection of 100 ng/g BW of gGRL-19 increased serum growth hormone levels 15 and 30 minutes after the treatment. This short term reaction may indicate that further studies with earlier time points may be necessary to see an effect from injections of CP-477335. In the in vitro whole pituitary culture experiment, growth hormone percent release was stimulated the most significantly from the two lowest concentrations (0.01, 0.1 ng/ml) of treatments tested. The 100 ng/ml dose of CP-477335 was also seen to stimulate percent GH release, although this is hypothesized to be due to a pharmacological effect as opposed to a true biological effect because it occurs at such a high dose. The resulting data appears to be a dose-dependent response that makes up the down side of a bell shaped curve. The next step in this study is to replicate testing but include lower concentrations of treatment in order to confirm or refute the expected bell shaped results. In contrast, a study by Kaiya et al. (2002) in which whole tilapia pituitary cultures were exposed to increasing concentrations (0.01, 0.1, 1, or 10 nM) of tilapia ghrelin showed a significant increase in growth hormone release (ng/h/100g BW) at only 10 nM (p&lt; 0.01) after 8 hour exposure to treatments. At the same dose of 10 nM ghrelin, there was an increase in prolactin secretion (ng/h/100g BW) (p&lt; 0.05). This may be an indication that the GHS tested, CP-477335, may be a more potent GH stimulator than ghrelin with regards to direct actions on the pituitary gland. The in vitro dispersed pituitary cell culture showed an increase in percent growth hormone release except at the lowest dose (0.00001 ng/ml), which seems to be too low of a concentration to cause a biological effect. However, this appears to be a linear, dose-dependent trend rather than a bell shaped curve, which would be expected considering what was seen in the whole pituitary culture. At this level, prolactin again displayed no significant change in its percent secretion due to treatments. Once again, in the study by P. Unniappan (2004) on goldfish, picomolar doses of 10nM gGRL-19 and gGRL-12 stimulated GH release from dispersed pituitary cells. Their positive data indicate that a clear correlation should be seen. Unfortunately, this cell dispersion and culture protocol is still in experimental stages and has many parameters that can possibly be modified in order to yield more accurate results, including optimal cell count, density, volume, well size, incubation time, etc. 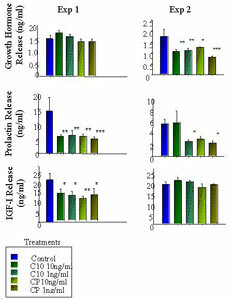 Conclusions that can be drawn from this experiment are that the effect of the novel GHS produced by Pfizer, CP-477335, does indeed induce growth hormone secretion as it does in mammals, but effects on prolactin remain unclear and lean towards having no effect on the release of that hormone. Further studies would be useful to provide a more precise and quantitative analysis of the effect of the GHS, CP477335. The authors gratefully acknowledge support from NSF grant #023600 and the University of Hawaii Sea Grant College Program. The authors also acknowledge Kai Fox for his continuous guidance and support throughout this project. Arsenault J, et al. (2004). Effects of water-borne 4-nonylphenol and 12B-estradiol exposures during parr-smolt transformation on growth and plasma IGF-I of Antlantic salmon (Salmosalar L.) Aquatic Toxicology. 66:255-65. Arvat E, et al. (2002). Ghrelin and synthetic GH secretagogues. Best Practice & Research Clin. Endocrin. 16(3):505-17. Duan C. (1997). The insulin-like growth factor system and its biological actions in fish. American Zoology. 37:491-503. Kaiya H, et al. (2003). Identification of tilapia ghrelin and its effects on growth hormone and prolactin release in the tilapia, Oreochromis mossambicus. Comparative Biochemistry and Physiology. 135:421-9. Kojima M, et al. (1999). Ghrelin is a growth-hormone-releasing acylated peptide from stomach. Nature. 402:656-60. Luque R, et al. (2004). Homologous and heterologous regulation of pituitary receptors for ghrelin and growth hormone-releasing hormone (GHRH). Endocrinology. 10. Moriyama S, et al. (2000). Growth regulation by insulin-like growth factor-I in fish. Bioscience Biotechnology Biochemistry. 64:1553-62. Muccioloi G, et al. (2002). Neuroendocrine and peripheral activities of ghrelin: implications in metabolism and obesity. European J Pharmacology. 440:235-54. Petersenn S. (2002). Growth Hormone secretagogues and ghrelin: an update on physiology and clinical relevance. Hormone Research. 58:56-61. Riley L, et al. (2002). Rat ghrelin stimulates Growth Hormone and Prolactin release in the tilapia, Oreochromis mossambicus. Zoological Science. 19:797-800. Unniappan S and RE Peter. (2004). in vitro and in vivo effects of ghrelin on luteinizing hormone and growth hormone release in goldfish. Regulatory, Integrative, and Comparative Physiology. 286(6):1093-101. Wortley K, et al. (2004). Genetic deletion of ghrelin does not decrease food intake but influences metabolic fuel preference. Physiology. 101(21):8227-32.